This past Tuesday, Feb. 11, at Terminal West, the up-and-coming band Phox charmed a friendly audience with their alternative folk/indie pop melodies. Hailing from Baraboo, Wisconsin, the seven-member group includes instrumentalists ranging from piano, guitar, drums and trumpet to shakers, banjo, recorder and ukulele. Self-reported on their website, the band is “a gaggle of goofy wizards performing minor illusions and big-top music,” and although their music tends to fall in line with the folk genre, they continue to demonstrate their inventive style with rock and electronic elements as well. The instrumentalists are all men (Matt Roberts, Zach Johnston, Dave Roberts, Matt Holmen, Cheston Van Huss and Jason Krunnfusz), and provide background vocals and harmonies for Phox’s lead singer: the sweet and effervescent Monica Martin. Phox is not new to the Atlanta music scene, as they were part of last year’s Shaky Knees Festival lineup and were headliners of a summer show at the Vinyl. The ages of the audience members at the Terminal West show ranged from early twenties to mid-thirties, and members engaged by swaying, foot stomping, singing along with the lyrics or simply surrendering to the all but hypnotic, soulful voices of the band. Field Report, the openers and close friends of Phox, set the serene tone for the night before the main act took the stage. Phox performed songs from their self-titled debut album that was released last summer, including the crowd pleasing “Slow Motion,” “1936” and “Kingfisher,” along with some songs from their new album to be released later this year. The songs are playful and layered with lyrics that cover family relationships, love and life in Wisconsin, all with a nostalgic underpinning. “Slow Motion” was by far the most recognizable and requested song of the band’s repertoire, with its fun call-and-response style of Martin’s voice, as well as background whistling and instrumentation. It is evident from the band’s distinct energy that they grew up together in Wisconsin and even live together on and off the road; the nerdy instrumentalists were corralled by their quirky queen as they interacted with the audience between songs. The set alternated between full band performances, solo work from Martin and her ukulele, and smaller harmonies with two band members backing up Martin. As any avid concert-goer knows, the location of the gig can make or break the performance; fortunately, Terminal West was a great venue for the band. The cozy interior along with the indoor balcony created an illusion of a packed house, while still providing an intimate setting. A downside to Terminal West’s location is that it borders train tracks, and at one point Martin was interrupted by a train. As a testament to the level of enthusiasm present within the crowded venue, this technical difficulty did not have an effect on audience engagement; on the contrary, the audience was further smitten by Martin’s flustered response for thinking the train was some higher power suspending her song. A few other times during solos and smaller harmonies, Martin and her fellow group members would stop and start again. Even though at times this stuttered structure lead to a lack of fluidity within the set, the intimate setting allowed for the accidents, as they gave the feeling of the band having a small jam session for their fans. Martin’s nerves were apparent within her soft-spoken conversations with the audience, but her reserved style made her all the more lovable. Near the end, the band highlighted some of Johnston’s music from his side project under the name Sonntag. 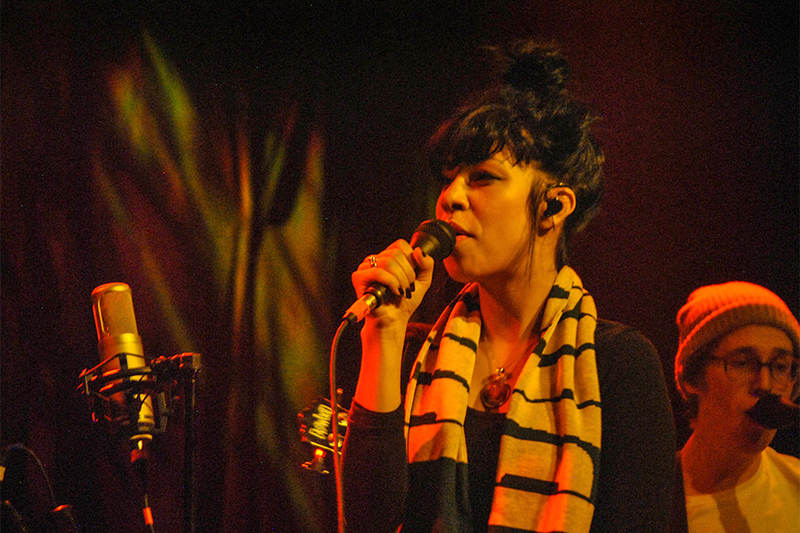 Despite a weeknight show, Phox did not leave anything backstage; Martin insisted on playing all of their material after a casual agreement with the audience, which wanted more. The band remained long after the show ended, taking pictures with fans and signing autographs. Overall, the night was a harmonic success; Phox’s tour continues north through the summer, and they can be seen at the Bonnaroo and Coachella music festivals later this year.